As with all ABUS hasps the steel is highly graded and performs substantially better than many of the other brands against attacks. It is made in Germany which is very rare nowadays and the quality control is maintained at a high standard. A common requirement is a CEN grade padlock and haps. Hasps cannot be CEN graded since the test includes things like number of pins, shackle strength etc. As such a hasp cannot be CEN rated. However, we can make equivalents based on strength. 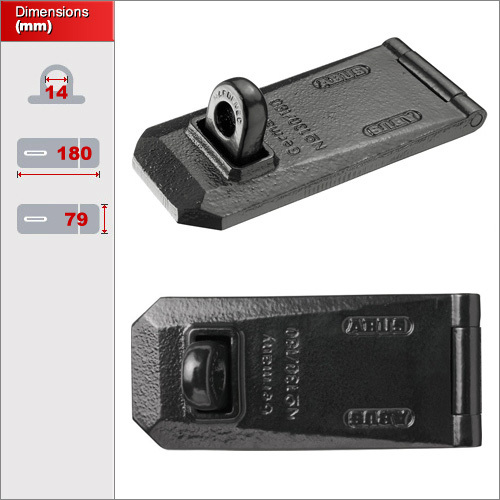 In this case it is the equivalent to CEN 5 and current;y the strongest hasp we offer. 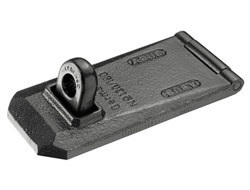 All coach bolts and supplied and once installed they are covered completely by the design. Which padlocks will fit this hasp? You can easily find the shackle thickness for each product by clicking "More Info" and then "Padlock Dimensions".